The Sunflower Community Garden at Grounds for Coffee started in 2009. 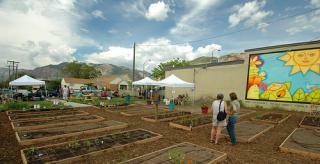 The Garden includes 37 garden plots: 30 for general use, and 7 reserved for local non-profits. General plots cost $25 per year, mostly to cover water costs. Heirloom seeds are sold at this site.